Richard Corbin, M.D., of Oasis Free Clinics in Brunswick. Dr. Corbin was recognized for his efforts as a volunteer physician, Medical Director and ultimately Board President for Oasis, who worked to ensure the highest quality of care for the organization’s patients and a healthy environment for employees during a difficult transition period. Through his leadership and a revitalization of the Board, the nonprofit has been able to consistently provide medical services to those in need, expand its offerings, and enter into a new era growth and sustainability. “I chose working for Oasis because they represent something I’m very passionate about. I’ve been a physician for almost 50 years, and I’ve supported universal healthcare coverage for that period of time, so it’s logical that I’d pick an organization that makes as its mission to promote care for those who can’t afford care,” said Dr. Richard Corbin at Thursday’s Leaders & Luminaries luncheon. Sharon Goguen, M.Ed., of Broadreach Family & Community Services in Belfast. Goguen was recognized for her key role as one of the original founders and a leader for Broadreach for over 30 years. Through her guidance, the nonprofit has received national recognition and has evolved from a local agency focused on early childhood special education programs to a leading organization for family services in Maine. The voice of reason and vision for the nonprofit, she encouraged the merger of several organizations with similar missions under the Broadreach umbrella to help create sustainability and efficiencies, as well as allow the agency to diversify its offerings and better serve families across their life span. Her ongoing work has led to new funding sources, growth and increased financial stability, as well as the recruitment of new board members with a wide array of expertise to help support the nonprofit’s mission. Elizabeth McLellan, RN, of Partners for World Health in South Portland. McLellan was recognized for her role as the founder of Partners for World Health and her leadership and guidance in collecting discarded medical supplies from our healthcare system to support those less fortunate and help hospitals in Africa and Asia provide basic health care to patients. Through her guidance, PWH has created a statewide network of hospitals and healthcare centers, as well as volunteers, to support its mission and received the 2016 Governor’s Award for the Best Non Profit Volunteer Program in the state. Strategically, McLellan has directed outreach efforts, initiated the Medical Mission Program, started chapter and internship programs at the college level, advanced public awareness of global health through speaking engagements and an education forum, and worked diligently to recruit board members with a wealth of experience to help develop and move the organization forward. Allan Teel, M.D., of ElderCare Network of Lincoln County in Damariscotta. Dr. Teel was recognized for playing a crucial role in co-founding the organization and helping to provide low-cost living options for older people unable to live independently in Lincoln County, the oldest county in the oldest state in the country. His commitment resulted in a unique and successful wellness model that now serves 58 low-income residents in seven homes and has been operating successfully for 18 years. To address the demographic, economic and social realities facing the region in the next 20-30 years, Teel developed a new Independence At Home program for aging in place that would extend the nonprofit’s reach and provide additional income for the organization. In leading by example, he continues to motivate staff, inspire fellow board members, and work to address ongoing needs and set the direction for ElderCare’s future growth. In addition to the four primary awards, the Bank also presented two “Emerging Board Leader” awards to Annemarie Albiston of Aphasia Center of Maine in Carrabassett Valley and Katie Wallace of The Locker Project in Portland. Annemarie Albiston was honored for her role as the founder of the Aphasia Center of Maine and dedication to raising awareness and improving the quality of life for 1,500 people in Maine who suffer from the communication disorder. As a dedicated leader, she continually develops opportunities to keep board members engaged and inspired in order to keep the mission moving forward. Katie Wallace, the founder of The Locker Project, was recognized for her commitment to connecting food insecure children in Maine with healthy snacks and food through school-wide food pantries and partnerships with organizations like the Good Shepherd Food Bank to reach children and families throughout the state. “Last year, a student at a local high school left an anonymous note in the pantry thanking us because now her family didn’t have to worry about where their food was coming from and that note has given me two years of energy. So that’s how I stay motivated,” said Katie Wallace during the awards luncheon on Thursday. With a clarity of vision, humility, and respect for those served, she motivates and inspires staff, volunteers, board members and donors to keep supporting the nonprofit’s mission. 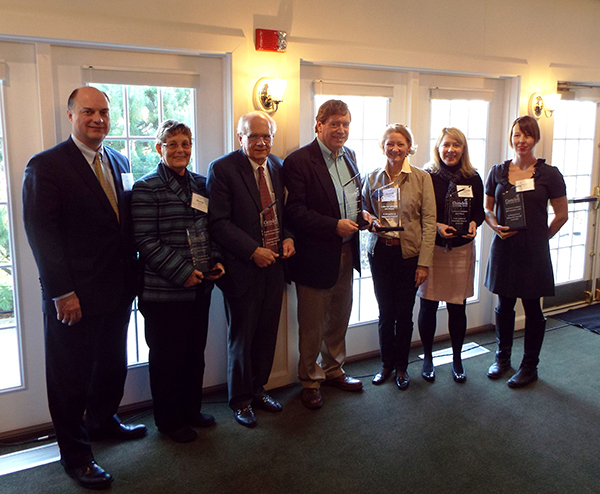 Presented through The Bank of Maine Charitable Foundation, the Leaders & Luminaries award recognizes nonprofit board members who provide invaluable services to their communities and demonstrate how inspiration, creativity and ingenuity in governance has led to his or her organization's success. An independent committee reviewed more than 72 nominations, submitted from across the state this year, and ultimately identified four top honorees. Camden National Bank is a full-service community bank that offers state-of-the-art online and mobile banking resources through a network of 61 branches and 85 ATMs throughout Maine, as well as lending offices in Massachusetts and New Hampshire. Headquartered in Camden, Maine, the bank employs over 650 people who are dedicated to providing the best banking experience for customers every day. To learn more, visit here. The Bank of Maine Charitable Foundation, a private charitable foundation operated by Camden National Bank, has been strengthening local communities through charitable giving and partnerships throughout Maine for over 25 years. Major charitable contributions awarded through the Foundation focus on supporting the vital signs of a healthy community which include education and youth services, health and human services, arts and culture, and economic development. For more information on Camden National Bank’s philanthropic efforts, visit here.